Standing at well over six feet tall, Principal George Duarte can cut quite an imposing figure as he strolls the halls of San Clemente High School. In his suit and tie, and with his somewhat military style haircut, students could be forgiven for mistaking him for a secret service agent sent to search out spies or hidden clues across the expansive campus. And in truth they wouldn’t be far from wrong. Along with his extensive education and experience in the educational field, Mr. Duarte is also a retired Army Reservist, who has served on some amazing assignments including a guard detail with then Secretary of Defense Donald Rumsfeld, and working on the prosecution of Guantanamo detainees in Cuba. He’s traveled the world, worked with highly placed government officials and researched some of the most sensitive prosecutions our government has undertaken, but he doesn’t hesitate a moment to claim that serving as principal of San Clemente High School is the most rewarding, and challenging job, he has ever held. After graduating high school in Redondo Beach, Duarte attended UCLA as a history major. Upon graduation he began his teaching career and also chose to enter the Army Reserves. The 21 years he put into the reserves would provide him with training that would prove invaluable to the job he does today. With the welfare of over three thousand students, a campus that stretches from Pico up the hill to the old Ole Hanson campus, and a staff that numbers in the hundreds, Mr. Duarte really does have his hands full. A recent morning spent in his office revealed a typical day in the life of a principal. Students dropped by with requests for help with fund-raising events including a bake sale to help pay the cost of the freshmen homecoming float and a canned food drive for the Assistance Ministry League. A teacher stopped by to discuss some new computer software to help to keep track of student achievement. There was a meeting with staff from the district facilities office to discuss suggestions on making the campus more handicap accessible and a secretary peeked in to get direction on a budget question. One thing that was apparent, Duarte’s door is always open, to staff, parents and students. According to Senior Kourtni Karn, "He’s really easy to talk to, he’s always joking around with us, but we know we can ask him things and he’ll do his best to help." Shortly after Kourtni retreated another student entered to ask for help organizing a fund-raiser for a sick friend. Mr. Duarte didn’t hesitate to offer suggestions and support for the student, and as the young man left, Duarte said simply," that’s why I love this job." Of course, there can be times that the job is not as much fun. Parents upset over their students’ poor grade, teenagers in cars careening around the parking lot, freak dancing in the very packed, very hot and sweaty gym … but Mr. Duarte seems to take it all in stride. He takes obvious enjoyment in his interactions with the students, and relates with the staff on both a personal and professional level. And his talents do not go unnoticed. Special Education teacher Judy Ray finds Duarte a talented administrator, "George is truly interested in all individuals connected with SCHS. He is very friendly and approachable, and has a great sense of humor and a willingness to try new things." With as much pride as Mr. Duarte takes in his career accomplishments, there is something of which he is much prouder still. And that, of course, would be his wife Fritzie, daughter Bayleigh and son, Bennett. Over the years his family has been asked to make many sacrifices while he served his country and they did so with no complaint. There was the time he traveled the world with Donald Rumsfeld and was only able to see his family three times over the course of the year. There were the long hours working with the Judge Advocate General, traveling between Virginia and Cuba on Guantanamo detainee prosecutions. And of course, there are the long hours any high school principal must put in. Long after regular work hours are over you can find Duarte attending a football or basketball game, a dance recital or stage play, rooting for his Tritons. "The kids love to see the support and I take great pride in all of our schools’ accomplishments," he remarked. The long hours may be wearing, but somehow Mr. Duarte always manages to have a smile on his face, his obvious enjoyment of his career choice shining through. "You know, I could do this job someplace else, but it wouldn’t be nearly as enjoyable. 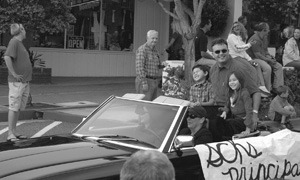 Everything about San Clemente, from the location, to the students to the parent involvement is just the best." He may feel lucky to be here, but there are many who feel that the townspeople are actually the lucky ones.